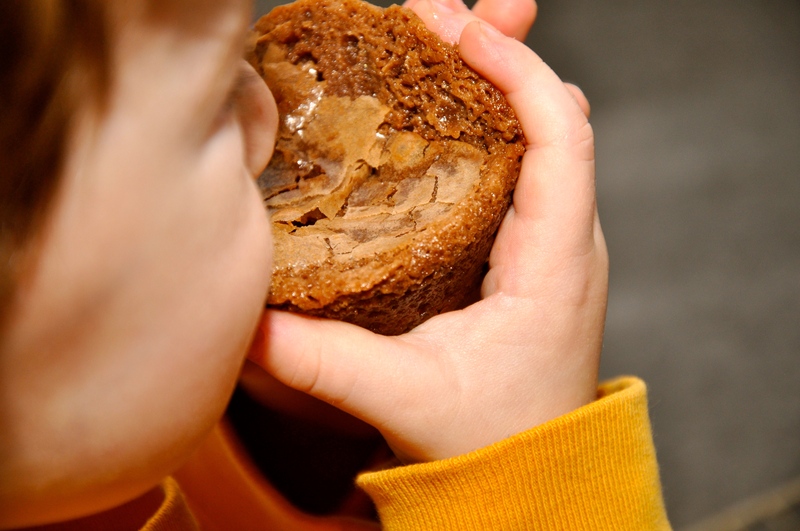 So chocolatey your head might explode, these fudgy brownie muffins are like individual pieces of heaven. Chewy, squishy, and decadent, they aren’t as dense as brownies, but they are so rich and creamy that they practically melt in your mouth. And, the glossy, wafer-thin top crust is just as delicious as the fudgy layer underneath. 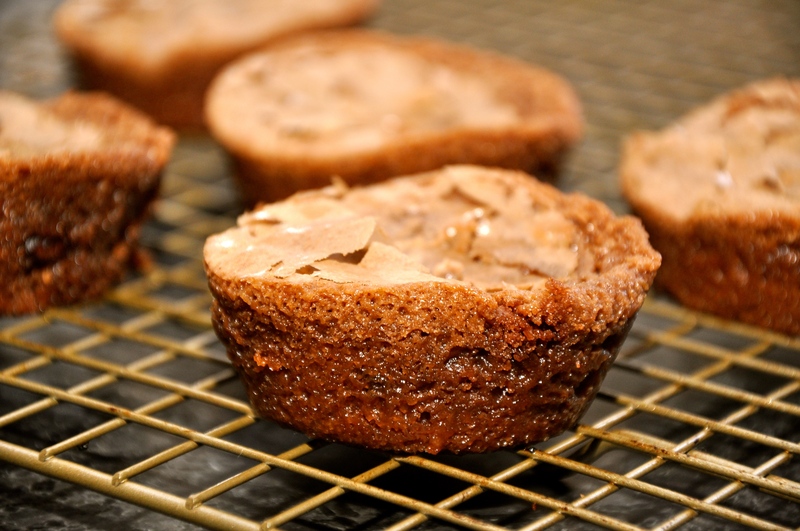 However horrible or amazing your day, these brownie muffins will make it better. 1. Preheat oven to 325 F. Spray muffin pan with nonstick spray. 2. In a large mixing bowl, melt the chocolate and butter together in the microwave in 30 second increments, stirring after each until completely smooth and combined. Allow to cool for a few minutes. 3. To the chocolate/butter mixture, stir in sugar, then vanilla. 4. Add eggs, one at a time, mixing well after each egg. 5. Mix in the flour and salt. 7. 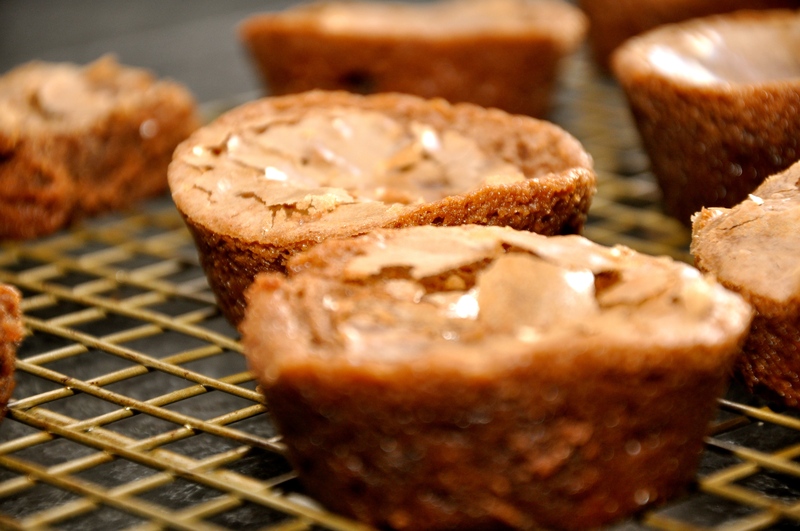 Allow muffins to cool for 10 minutes before transferring to a wire cooling rack. Or, cool in refrigerator for 30 minutes before transferring to a serving platter. *These muffins are best served cold. 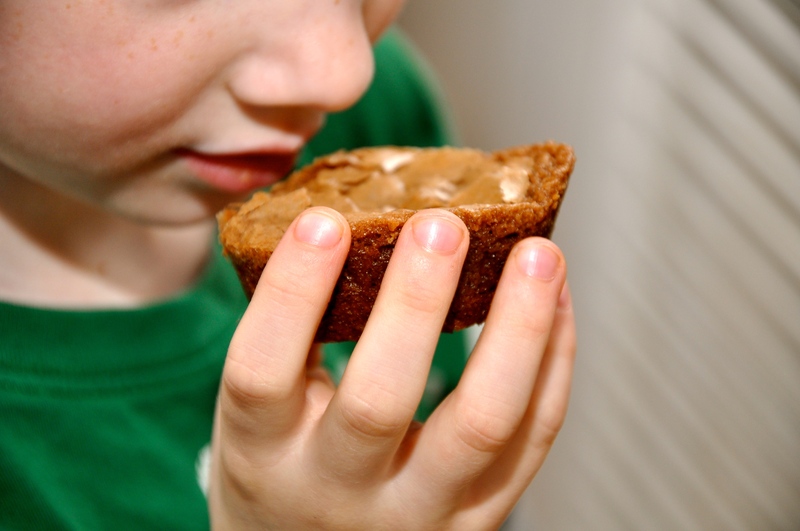 Here’s an ingenious way to sneak green into your child’s diet. 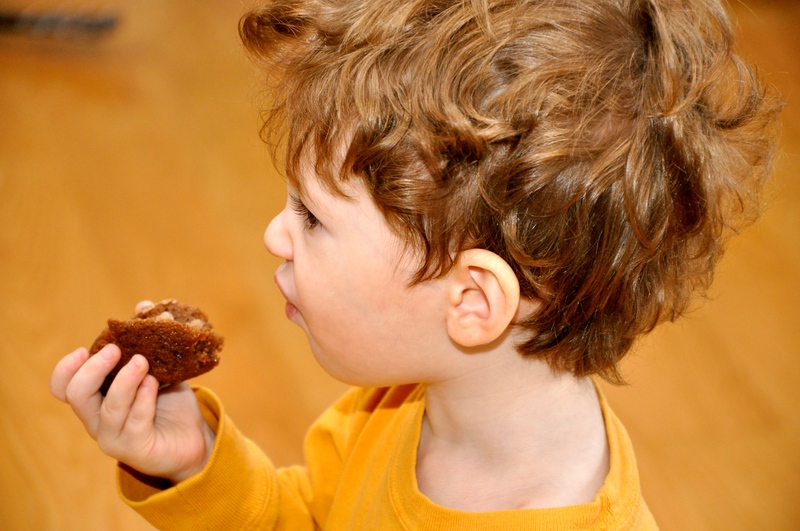 With this muffin, you can give your child cocoa with a clear conscience. The combination of grated zucchini and chocolate is a God-send because the zucchini, which adds moisture, is a vegetable that passes virtually undetected. 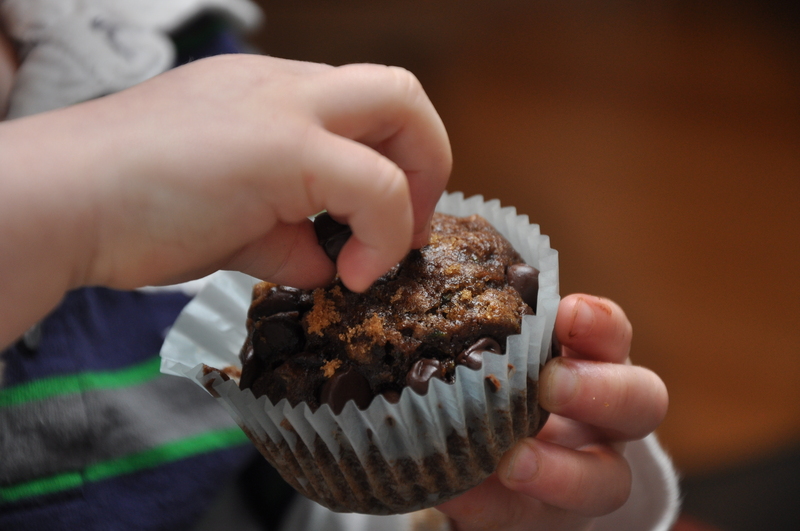 Whether you refer to this muffin as “chocolate” or “chocolate zucchini,” the flavor speaks for itself. 1. Preheat oven to 350 degrees. Grease muffin pans with cooking spray or line with paper liners. 2. In a large mixing bowl, beat the eggs. Beat in the sugar and oil. Add the applesauce, cocoa, vanilla, zucchini and stir well. 3. 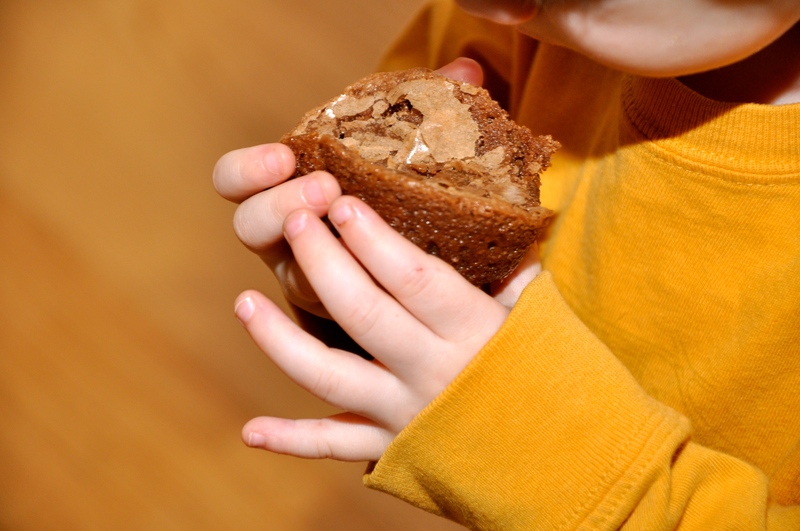 In a separate bowl, combine the flour, baking soda, baking powder, salt, and cinnamon. 4. Add wet ingredients to dry ingredients, mixing until dry ingredients are just moist. Fold in 2/4 of the chocolate chips. 5. Spoon batter into greased muffin pan, filling each muffin cup about 2/3 full. 6. Top with 1/4 mini chocolate chips and some brown sugar. 8. Remove from pan and let cool on a wire rack. My kids love spaghetti. There’s something about the challenge– attempting to twirl the strands onto a fork and slurping up the strays. Pure fun. And what could be even more fun? Picking at the crispy, crunchy, toasted tops of spaghetti muffins. Here is a great way to recycle and reformat leftover spaghetti. The topping is the icing on the cake of handheld spaghetti nests. They are whimsical for kids and delightfully suited to adult tastes, too. If you have any leftover, they toast wonderfully. 1. Preheat oven to 425 degrees. Grease muffin cups with cooking spray or line with paper liners. 2. In a large bowl, mix eggs, cheese, bread crumbs, and meat (optional). 3. Add mixture to pasta and toss. 4. Scoop pasta into muffin cups. 5. Sprinkle Topping over each muffin cup. 6. Bake for 8-10 minutes. 8. Remove from tins, serve, and enjoy! 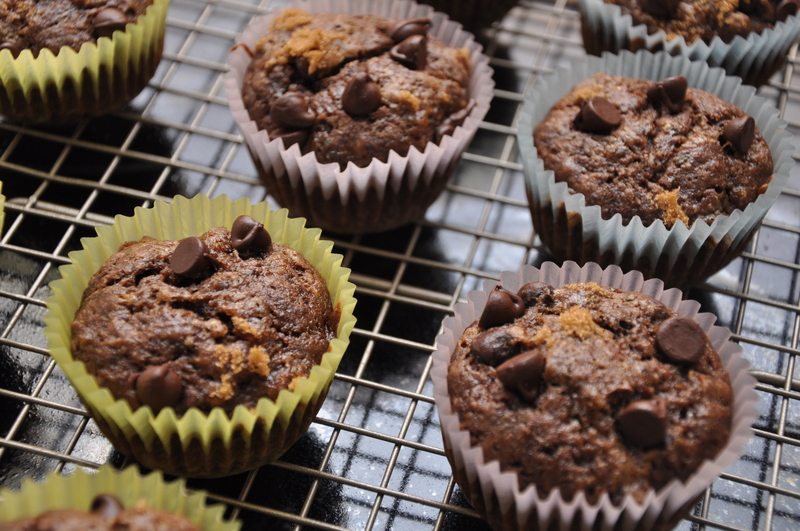 If banana bread doesn’t do it for you, these muffins will have you at hello. They are entirely healthy and delicious. And, who could say no to chocolate? Soft, tender, with a subtle sweetness and loaded with chocolate flavor, these muffins have far less sugar than a typical bakery-style muffin. Microwave already-baked muffins to make the chocolate chips warm and melty. Spread with peanut butter if desired! For a sweeter variation, substitute peanut butter chips for some or all of the chocolate chips. 1. Preheat oven to 350 F. Spray muffin pan with non-stick cooking spray (do not use liners, they will stick!). 2. In a medium-size mixing bowl, combine flour, cornstarch, baking soda, salt, cocoa powder, and both types of chocolate chips. 3. In a separate medium-size mixing bowl, whisk together the egg and Greek yogurt. Stir in coconut oil, vanilla, brown sugar and bananas. 4. Pour wet ingredients into dry ingredients and mix until just combined. 5. 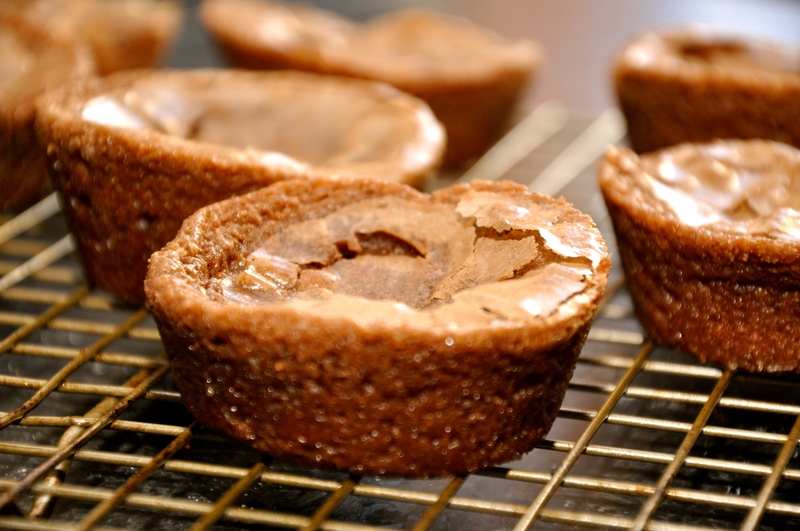 With an ice cream scoop, distribute batter evenly into muffin cups. 6. Bake 18 to 20 minutes or until a knife inserted into the center of a muffin comes out clean. Been-there-done-that? These blueberry muffins are worth it. As a Mom of three kiddos, I’m always looking to streamline. 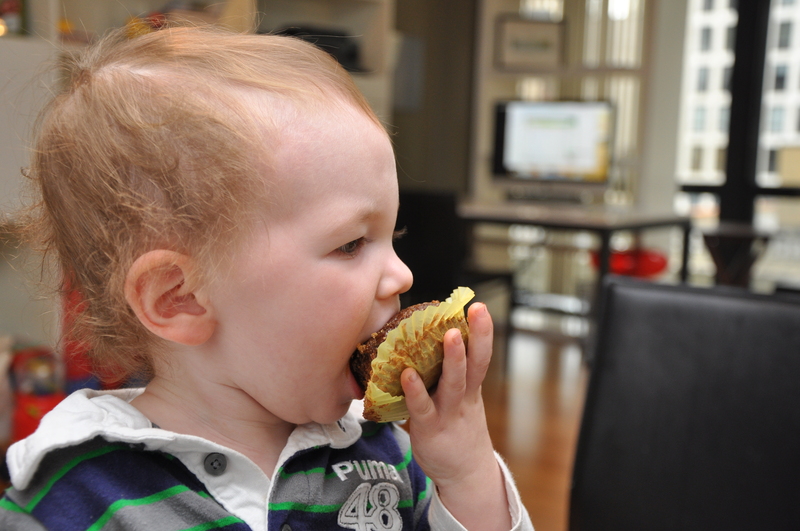 Since my almost-one-year-old can eat a whole box of blueberries by his lonesome, I muffinize® by pumping healthy ripe blueberries into an easy batter that makes super moist muffins with a delicate crust. 1. Preheat the oven to 375. Grease muffin pan with non-stick cooking spray. 3. Add the eggs, one at a time, and mix well. Add vanilla. 4. In a separate large mixing bowl, combine flour, salt, baking powder and cinnamon. 5. Add creamed mixture and milk to the flour mixture and mix until combined. 5. Crush 1 cup blueberries with a fork, and mix into the batter. 6. Coat remaining whole berries with flour and then fold them into the batter. 6. Distribute batter into each muffin cup. Sprinkle the 3 teaspoons sugar over the tops of the muffins, and bake at 375 degrees for about 30 minutes. 7. 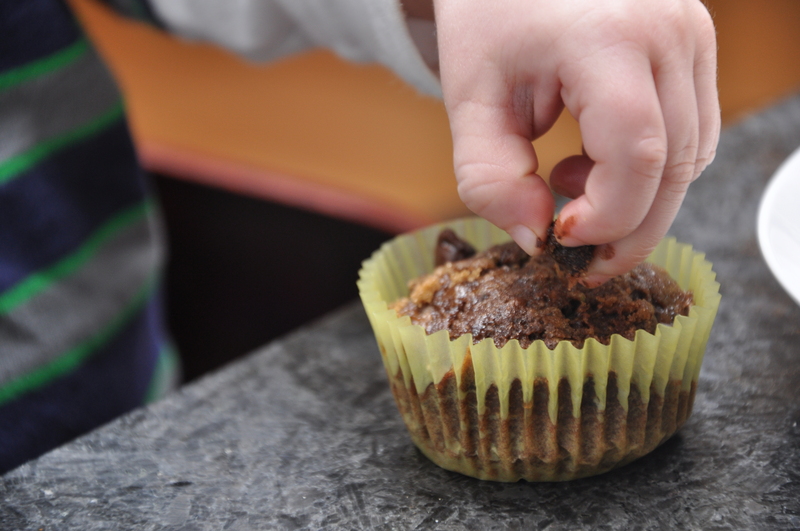 Remove muffins from tin and cool at least 30 minutes. Store, uncovered, or the muffins will be too moist the second day, if they last that long.